Bed – Hannah Loves This! I think my bed might be the best thing I own. At the moment I can’t stop sleeping (must be my diet or something), and getting into bed and feeling the cold softness of the sheets is heaven. I love getting myself wrapped right up in the covers. I love my sheets too. They’re so happy and colourful, pink and orange and turquoise, dark green, yellow and beige. An enormous patchwork of flowers and leaves, squares and stripes. Once upon a time I was only ever allowed plain white hospital-style sheets, which doesn’t sound like a big deal, but actually it had a real effect on how happy I was when I went to bed at night and woke up again in the morning. It’s funny how small things can make such a big difference. My bed itself is one of those very feminine metal-framed ones: swirly and curly and pretty and cream. I did have star lights draped across the headboard, but the cable doesn’t reach to the socket in my temporary bedroom, so it’s not quite as pretty as usual right now. I’m looking forward to having the star lights back because they dapple the room in star-shaped shadows. I think ‘bed’ would be a fairly popular choice amongst people’s loves. You spend so much time there, it’s got to be a happy place. 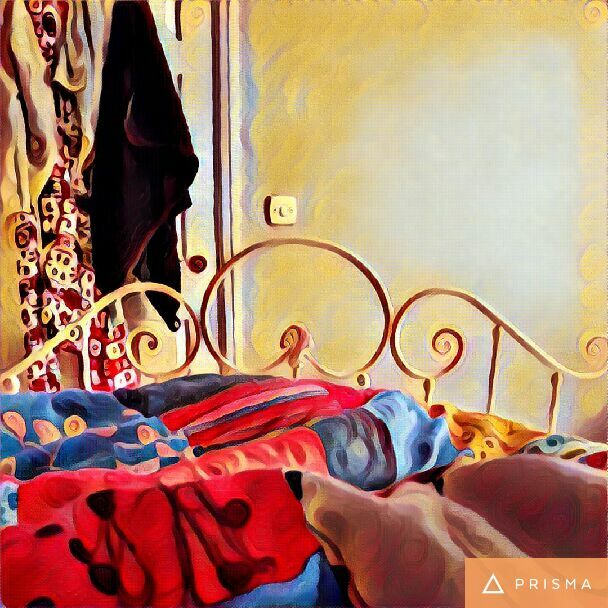 Posted in Home, Real LifeTagged Bed, Colours, Lights, Sheets, Sleeping, StarsBookmark the permalink.